Cézanne would paint only three more self-portraits in his life and of these one can be dated from his stay in Giverny in 1894, when he visited Monet. 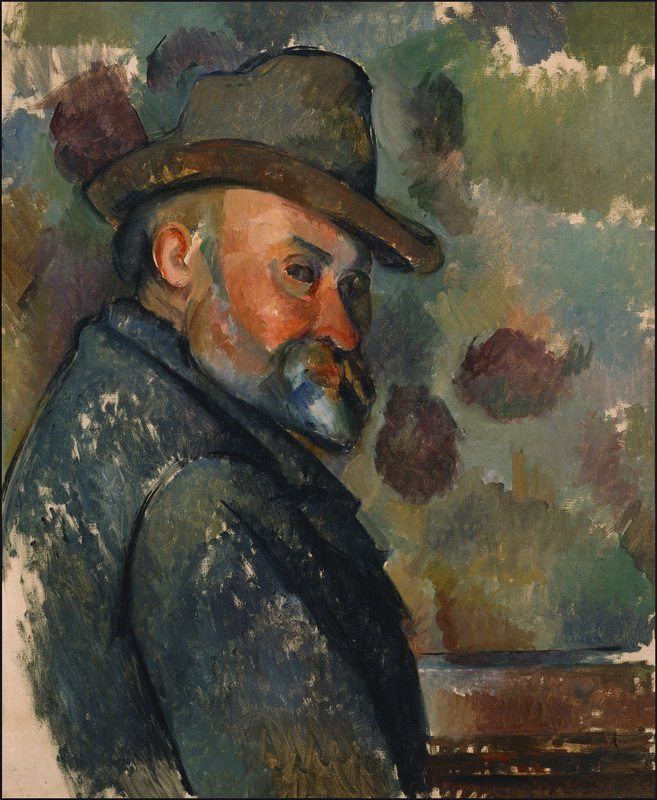 Like some of the heroic self-portraits from his younger years, Cézanne coiffé d’un chapeau mou shows him from slightly below, looking at us over his shoulder; the skin is ruddy, the flesh is full, the beard is incisively trimmed. But the head is turned just a bit farther from us and the eye looks at us more askance, and the expression seems more suspicious, so we are inevitably reminded of Cézanne’s unfortunate reply to Monet, who welcomed him in company with warm affection and praise, only to have Cézanne say in dismay, « You, too, are making fun of me » and leave. But whether the portrait reveals a state of mind or not, it is above all a splendid painting. The whole is done with a beautiful economy of secure brushstrokes—secure in the incisive modeling of the face, of course, but secure also even when merely scumbled to contrast with the head. 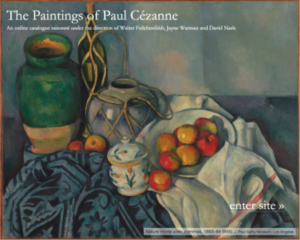 Cézanne takes interesting risks with the composition: he confines the figure to the left half of the canvas and fills the space around it with irregular patches taken liberally from the wallpaper pattern behind it. The darkest ones touch the brim of the hat and abut his beard, prolonging the sharp diagonal of the jaw and giving it a massiveness that balances the heavy torso. They create a simple color scheme, with their dull purples set against dull greens, against which the face appears even more ruddy.